The Anton Webern Gesamtausgabe (AWG) is a critical-historical edition which aims to make Webern’s entire oeuvre accessible to musical scholarship and practice in a scholarly form. The edition includes not only all the works Webern himself had forwarded to be printed but also their unpublished variants. It also includes compositions that were never made public in his lifetime, works from his youth and student years, as well as fragments, sketches, arrangements and revisions of his and other scores. The AWG is based at the Musicology Seminar of the University of Basel and works in close collaboration with the Paul Sacher Stiftung (Basel), which holds most of Webern's existing source material. The Swiss National Scientific Foundation has supported its activities since October 2006. Furthermore, since 2008 an office has been set up in Vienna in cooperation with the Österreichische Akademie der Wissenschaften. Its aim is to find new information and undisclosed documents concerning the history, the reception, and the historical context of Webern’s oeuvre. Since January 2010 this collaboration has been extended thanks to a grant from the Ernst von Siemens Musikstiftung. The AWG will be released in a Hybrid Print-Online Edition, the printed volumes being published by Universal Edition (Vienna). The AWG understands itself as a centre of competence comprising, beside its editorial work, a network of archival, documentary, analytical, communication, service-providing, and organizational activities. Neue Perspektiven. 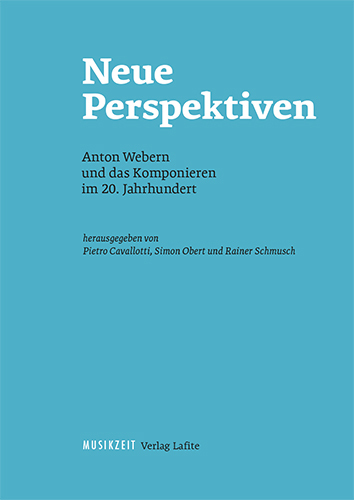 Anton Webern und das Komponieren im 20. Jahrhundert, ed. Pietro Cavallotti, Simon Obert and Rainer Schmusch, Wien: Lafite, 2019 (Webern-Studien 4). New article published: Thomas Ahrend, Michael Matter: "Webern, Anton" (including work catalogue and bibliography), in: KDG - Komponisten der Gegenwart, 2018. Online available at Munzinger Online. Happy Birthday, Webern! On this day 135 years ago, also a Monday, Anton Webern is "delivered by a midwife" in Vienna, III. district, Löwengasse 53a. 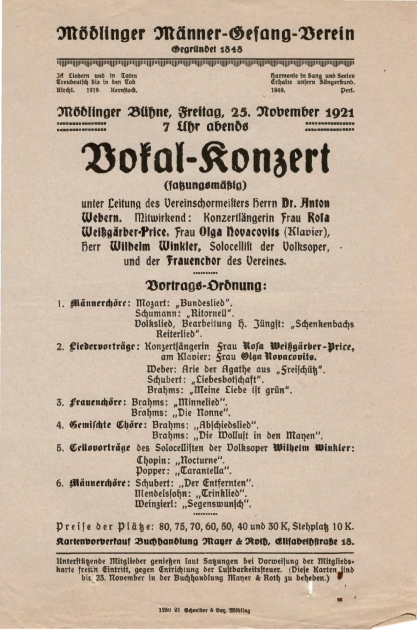 The source was discovered in the archive of the Männer-Gesang-Verein (today: Chor Kontroverse) by its current director Andreas Brüger.